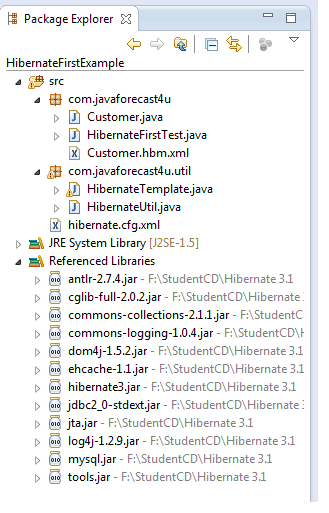 There is hibernate mapping file which is corresponding to Customer class call customer.hbm.xml. This mapping file is use to map the class to table and property to column. There is a hibernate configuration file called hibernate.cfg.xml. This file is use to configure the database. The other files are HibernateFirstTest.java which is client class, HibernateTemplete and HibernateUtil. <!DOCTYPE hibernate-configuration PUBLIC "-//Hibernate/Hibernate Configuration DTD//EN"